Hi-Lo Heros 2010 - Review it at Lord Bingo NOW! 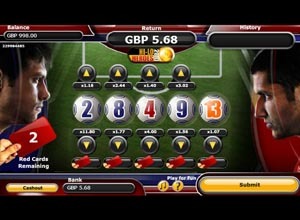 Step 1 – Select your stake using the buttons on the bottom left hand corner of the game. The minimum bet you can make per game is 10p and the maximum is £100. Step 2 – In the middle of the game/football pitch you will notice that there are five different footballs each with a number written on them. There are a pool of 52 different numbered footballs in total that are divided into four different colours (Yellow, Black, Blue and Red) and labelled between 1 and 13. The aim of Hi-Lo Heroes 2010 is to correctly predict if you think the next footballs number will be higher or lower than the football number currently showing. If you think the next football will be higher then click once on the arrow above; however, if you think it will be lower then click on the arrow below. The unique aspect of this game is that you do not have to bet on each ball; therefore, you could simply only bet on one ball if you want too. Once you are happy with your choices in this instant game click on ‘Submit'. Step 3 – The Hi-Lo Heroes 2010 instant game will then spin all five of the balls and replace them with new numbered footballs.If you managed to guess if the balls were higher or lower successfully, then you will be able to collect your winnings, or re-stake them on another spin. If you do decide to take another spin, then you will notice that you have a ‘Red Card'. This card can be used to replace or send off an existing ball before you go on and make another stake. 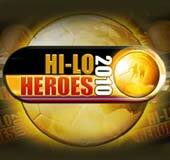 Step 4 – Hi-Lo Heroes 2010 game ends when you either make a wrong prediction or your reach the 100th draw. Hi-Lo Heroes 2010 is a fun packed football themed progressive instant game, which features some exceptional graphics of a football pitch, players and even a referee holding a red card. This instant game is open to all players no matter what their budget, as you can play the game for as little as 10p a spin. The aim of the instant game is to pass through different rounds or should we say matches, by correctly predicting whether the next footballs will be higher or lower than the balls currently showing. Players can see the odds for each of their predictions above or below the footballs and can even change balls by using their ‘Red Cards'. Players can earn a Red Card each time they successfully pass through a different round; however, make sure they don't go to waste, as you can only have up to five Red Cards at a time.